Grab a cup of coffee/tea because this is going to be a long post. It appears I just can’t say no to reading challenges even if I don’t complete them so here are the ones I’m joining in 2018. Book Bingo 2018 hosted by Stacey at Unruly Reader. This is my first year participating and I’m hoping to either complete a column or row. There are 25 awesome categories to choose from and I’ve already made a print out of the Book Bingo card and pasted it into one of my journals so I can keep track. Nonfiction Reading Challenge hosted by Katie at Doing Dewey. There are various levels and ways you can do this challenge. I want to strive for reading 6 nonfiction books from any category. European Reading Challenge hosted by Gilion of Rose City Reader. I tend to read a lot of books set in Europe so I have to complete this challenge right? My goal is the Deluxe Entourage which means reading at least five books by different European authors. I think that should do it…. for now at least. Like I always say, for me reading challenges are really about the fun. I don’t necessarily set out to complete them but my intention is to maybe read a new genre, make some new blog friends, discover new authors, etc. Oh and I know that part of the fun in participating is putting together potential book lists but this post was already getting a bit long so I didn’t want it to get longer. I will try to post periodic updates and maybe then I’ll post some more book titles. So let me know if you are participating in any of these. 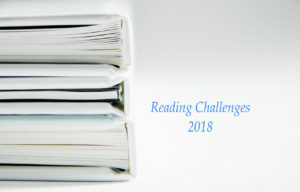 Would love to hear what your plans are for reading challenges! I am glad you filled us in on what you’re doing, and letting us know more about what’s out there. I like how you said you’re joining even if you don’t finish. Good plan! So excited you’re doing Book Bingo! I’m looking forward to hearing which categories you select — and which books. May the fun begin! Good luck with your challenges! These look fun. I might possibly think about one or two, but we’ll see. I think signing up for challenges and making lists is almost the most fun part of doing it. Good luck this year! Have fun with the challenges Iliana! Unruly Reader – Thank you for hosting the challenge. Loved the bingo card and am ready to play. I think I even got one book going on that fits the category! Kay – Oh I hope you join in on the fun! Lark – I know right? Oddly enough I think I have several titles on my shelves that fit for that category! Melody – Thank you! Are you going to do some too? Kailana – Thank you! Hope we see more of you in blogland! That’s a lot of challenges! At least they are all varied and some of them wide open enough that it should be fairly easy to fit in sudden whims as well as those books you have always been meaning to read. Have fun! What’s in a Name sounds like a fun challenge! I’m doing the Back to Classics one and I’ve already read one book from my list which is a good start. lol. Good luck with all of your challenges! YAY to What’s in a Name! It is THE one I always commit to. I’m a little nervous to even go check out the Back to Classics because I did so poorly at it last year. But I love the motivation so I will. Go look at it, that is – I may not commit. Thanks for coming by and chatting at my blog and here’s wishing us a wonderful reading year. Good luck with your reading challenges, Iliana! They all sound like fun. I’m looking forward to What’s In a Name and the Bingo challenges this year, especially. Fun list! I’m looking forward to the Nonfiction challenge. The What’s in a Name one looks fun, too. Kristilyn (Reading in Winter) – Yay, so glad you are also doing Back to the Classics. Hope you have fun with it! Care – I know, isn’t that a great challenge? Loved seeing your list of potential reads. I didn’t do so well with the Classics last year but there’s always this year right? Literary Feline – Yay, glad you are also doing What’s in a Name. Saw some of the other challenges you are doing and those sound fun! Here’s to a great 2018 in reading! Joy Weese Moll – Oh me too. I always need a bit more motivation to read nonfiction so hopefully that will help me read a bit more in that area. Hope you have a great time with the challenge too! These all sound like fun and I am very tempted to join in on a few of them, but I probably best focus on my own plans. I might, however, borrow some as reading ideas, though. Looking forward to hearing about the books you are reading for each one.